'America Meriodonales per fua Regna Provinc ...juxta obfervation et defcript recentis'. 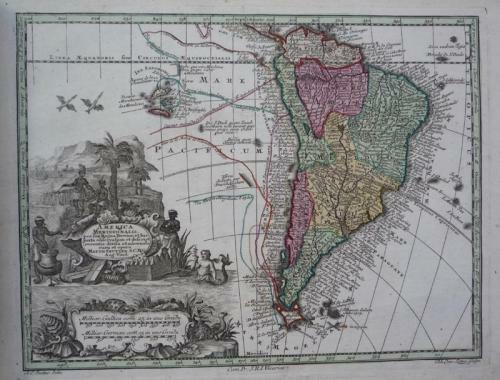 A decorative "slender" view of South America. Numerous place-names not only mark the coastal features but also most of the interior and the tracks of several important voyages in the Pacific are also shown, along with names of navigators and dates. The title and scale-bars are contained within a large ornate cartouche at lower left.